Posted: Sunday, August 21, 2016. 2:58 pm CST. By BBN Staff: Tropical storm Fiona is expected to weaken as it moves into unfavorable conditions. At 5:00 a.m. on Sunday Tropical Storm Fiona was located at latitude 22.2 north, longitude 51.7 west and moving toward the west-northwest at 16 mph. The maximum sustained winds are near 45 mph. Fiona is forecasted to become an area of low pressure early this week in the central Atlantic Ocean. 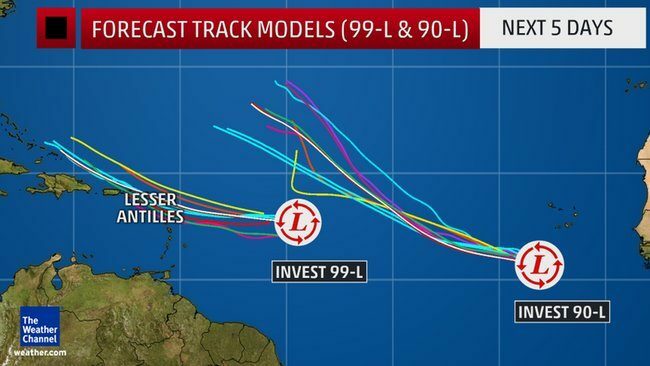 Meanwhile, two disturbances in the central and eastern Atlantic Ocean, Invest 99-L and Invest 90-L, are being monitored for potential development into the next tropical storm over the next few days, reports the Weather Channel. Invest 99-L is currently a tropical wave just over 1,000 miles east of the Lesser Antilles and has a moderate chance of development into a tropical depression or tropical storm over the next five days. It could bring heavy rain to the Lesser Antilles beginning late Tuesday. Farther east, an area of low pressure associated with a tropical wave just emerged off the West African coast, and is likely to develop into a tropical storm by mid-week. We’re now headed into the climatologically most active time of the Atlantic hurricane season, reports the Weather Channel.